When I got pregnant, well even before I got pregnant, I swore my blog would not turn into a baby blog! Well, I’m starting to accept that this blog, above all else, is a lifestyle blog and that means that a few baby posts here and there are inevitable. Plus, as a new mom I love talking baby. My sincere apologies if you aren’t interested, feel free to skip any baby related posts or even bookmark them for future reference if they don’t apply to you at the moment. Sleeper Portion of Pack n Play | While we’re loving the whole pack n play because it’s our baby command center downstairs (where we usually hang out), the vibrating sleeper part of the pack n play was such a lifesaver the first few weeks we were home. It was one of the only places that Atlas would sleep comfortably and the vibrations would put him right to sleep. I love that it’s removable because some nights we’d bring it upstairs and put it next to the bed in place of the rock n play if he fell asleep in it right before bedtime. Rock n Play (Auto Rocking) | Because I want Atlas as close to me as possible, but I’m not 100% comfortable bedsharing, the rock n play has been great! I have it placed right next to my side of the bed so Atlas is within arms reach. It’s also at an incline so I’m not as nervous putting him in there after feeding him because he’s less likely to spit up. But the best, best part is the automatic rocking! Lately he hasn’t needed it really, but the first few weeks I would have it rocking all night and he was mostly a happy camper! Swaddlers (Summer Swaddleme + Love to Dream Swaddle Up) | Being in the NICU, Atlas is so used to being swaddled. I have mixed feelings about it because it seems so restricting, but he really does sleep better and longer when he’s swaddled. Our favorites are the Summer Infant Swaddleme, which puts him into a nice tight swaddle, and the Love to Dream Swaddle Up because it lets his arms be up near his face which is where they naturally end up most of the time when he’s sleeping so he’s not struggling to get them out of the swaddle. First Years Quick Serve Bottle Warmer | Being the type of person who wants to have as little as possible, I was convinced we didn’t need a bottle warmer. But after about a week of waiting forever to boil water and waiting for his milk to warm up, I decided it was time to try it out. I was reading reviews for this one and found out that it’s steam powered and I was sold! Not only does it warm up most bottles in about a minute with minimal water (I’m talking maybe a teaspoon), I can easily sanitize his pacifiers too. Fisher Price Diaper Backpack | I was convinced I’d be one of those moms with an adorable diaper bag, but I guess I was wrong. Originally we registered for this backpack for Blaine to carry around. But because I wanted a cute purse to use as a purse and diaper bag combo, and haven’t been able to find one, I’ve just gotten used to the backpack. I’m still kind of on the lookout for a purse, but until then I’m more than happy with this backpack. Most of the pockets are labeled so we know exactly where everything is and can easily locate a pacifier or diaper when needed. Ingenuity ConvertMe Swing | The swing is quite possibly the only place that Atlas will sit, awake and content, for any amount of time. Our morning routine usually begins with us coming downstairs and me plopping Atlas in the swing for about 15 minutes, more if I’m lucky, while I let the dogs out, feed the pets and make a quick breakfast (usually a bagel and coffee or tea). I’m in love with this swing because it folds up and stores easily when we don’t need it out. I, honestly, don’t fold it up that often, but it’s convenient when we need to get it out of the way. 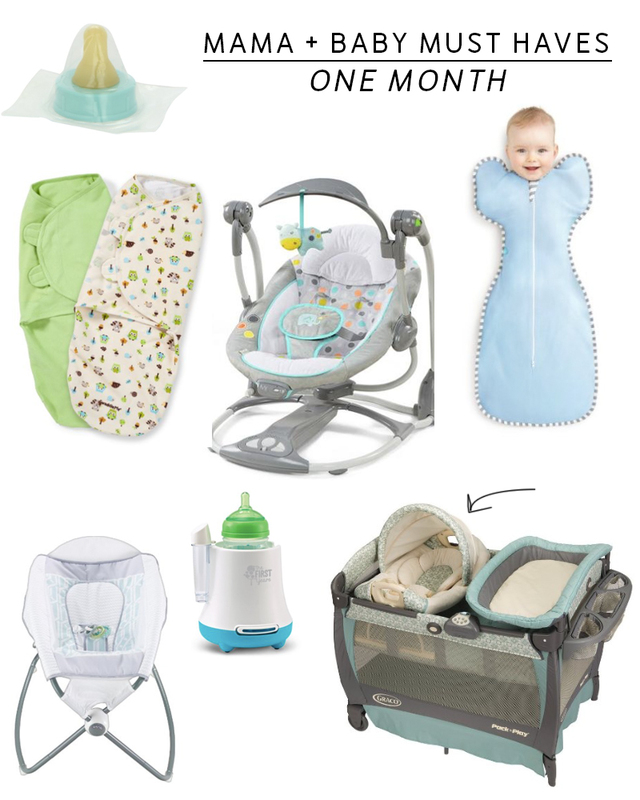 If you’re a parent, what were your favorites in the first month? Note: the links above are affiliate links and I do receive a small commission on any items that are purchased using the link(s). This does not cost you extra and you are not obligated to click. However, I do appreciate the support through using my referral links!